You can send any campaign you create in your account as an email. You can send it as many times as you want, and to any contacts in your Subscribers. You will also be able to send an existing campaign from your mobile device. 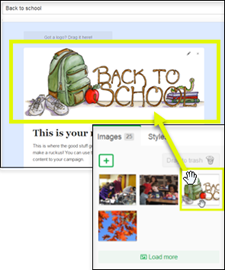 Find your campaign on the Campaigns page, and click the Sendbutton underneath the thumbnail. Note: If you’re sending directly from the Composer, just click the Continue button in the bottom right corner of the composer page. There are two steps to the sending process, but don’t worry! Your campaign will not send until you confirm everything after the final step. Send to individuals field: If you want to send a test to just yourself, or a few folks who aren’t collected in a list, just type them here. This field is optional. Note: Anyone added to the Send to individuals field who is NOT already a member of your Subscribers will be added to your All subscribers list, when you send. Subscriber lists: Click Include next to any list you want to send your email to. 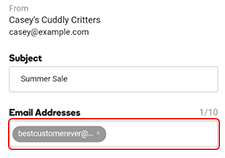 Click Exclude next to any list you want to make sure the email does not send to. Read more about excluding lists, here. Note: You can confirm your list selections on the right side of the page. Edit the following options, to your liking. From Name This will default to your account name, the first time you send any email. For all subsequent sends, it will default to the last name you used. You can edit this each time you send. From Email This will default to your account email, the first time you send any email. For all subsequent sends, it will default to the last email you used. You can edit this each time you send. Subject This will default to the Campaign Title, the first time you send a mailing for any campaign. Any subsequent sends will default to the subject line previously sent. Second Send… This is optional. If you select this option, your email will automatically send again, in 72 hours, to anyone who did not open the first email, using the secondary subject line you enter. Don’t send this to people who already received it This is optional. If you select this option, people who have received this campaign before, will not be sent this email. Read more about this option. Enable link tracking Make sure this is selected. This allows Email Marketing to report back to you the details of what happened with your emails. Usually you don’t want to turn this off, since you won’t receive any statistics reporting if link tracking is disabled. Read more about mailing statistics, here. Make my email look awesome on all devices This is optional. Your email will be responsive with this option selected. Social sharing Select the social platforms you want to include in the sharing buttons, at the top of your email. These buttons allow your readers to like, tweet, pin, and +1 your campaign. Click the Send button when everything looks good. But don’t worry! Your campaign will not send, yet — you have another chance to confirm all the details. Here’s your final chance to look everything over. All your recipient and mailing details are displayed for you, together, in one place. Click Looks good. Send it! to get your mailing on its way. 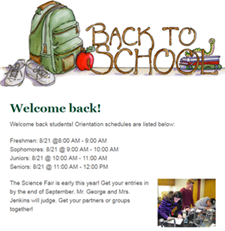 Note: If you need to make any changes to these details, click the Cancel link in the bottom left corner. If this is your first-ever time sending, you may need to go through our quick verification step. Otherwise, your email is on its way! You can resend an existing campaign from your mobile device. Once you’re logged into your Email Marketing account, locate the campaign you want to resend. Tap Send Again to access the campaign. Enter the email address to where you would like to resend the campaign to. Tap Send to resend your campaign. Follow these steps to add contacts to the subscribers area of your Email Marketing account. Select the Subscribers tab at the top of your account. Click on Add Subscribers to reveal the import options. Select the Many at a time tab to choose a file to upload. Or select the One by one tab to enter your contacts individually. Note: If you would like to add just a single contact, you can use either tab. In the One by one tab you can add the email and name details into special fields for that data. And in the Many at a time tab, you can simply paste the details into the Paste subscribers field. Click Browse to find the file you want to upload. Paste your subscriber details into the Paste subscribers field. Under the One by one tab, enter the name and address details in the provided fields. Select All from the drop-down list to add the contacts to your master list. Create a new list for your subscribers. Note: If you are on the One by one tab, the window doesn’t close automatically. This is so you can easily add another subscriber. To close the window, just click the X.
Email Marketing now uses responsive email templates. 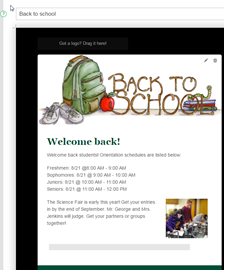 With the responsive email templates, your emails will automatically scale to fit any screen. Whether it’s viewed on a laptop or a smartphone, your campaigns will look great. There’s no additional action needed to take advantage of the feature. 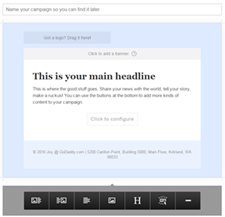 Recent email campaigns or newsletters you’ve created appear in the center of the Campaigns page. All others appear under the Compose! button in the sidebar. When you select a campaign, it opens in the center of the Campaignspage. Statistics appear in the summary section for each campaign. These numbers show the total overall stats for the campaign. Click more stats to see a detailed overview of the campaign. Learn more about email marketing statistics. These tools are available for each campaign on the Campaigns page. Edit Click to open and edit the campaign. Clone Click to “clone” a campaign, making an exact copy of the campaign in the Campaigns page. Email Marketing adds an incremented number to the campaign title so you know which copy is the clone. Share Click Share to see a list of social media platforms where you can share the campaign. If you’ve set up the social sharing buttons in the email, you can click any of these to directly share the newsletter on a social network. Schedule Click to schedule the campaign. Send Click to send the campaign to subscribers. more stats Click to show the overall or combined stats for all mailings of a campaign. Note: This article covers creating a campaign with text and images using the tools availble in Email Marketing. It’s possible for you to create a plain text email campaign, or you can use custom HTML to create a campaign from scratch. 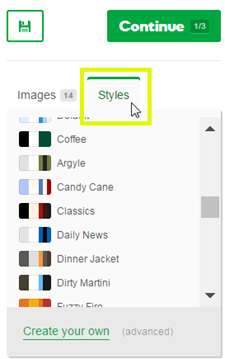 To change the color and formatting of your campaign, click the Stylestab that is located in the right pane next to the Images tab, and choose a style. Your sitemap defines your website’s structure and content, which is something search engines use to crawl and index your site so it can be properly ranked in search results. Search Engine Visibility® helps you optimize this information to increase traffic and make your site easier to find. Once you have created your tags using Search Engine Visibility, you need to add the code to your site for search engines to locate. Search Engine Visibility lets you view your site’s current tags and create populated tags for easy downloading and pasting in your Web page’s code. Click the Current Tags tab to view your site’s active tags. 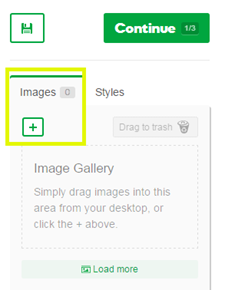 Use the Back and Next buttons to navigate between your site’s pages. For details on placing the tags in your Web page’s code, see Where do I paste these tags? Using Search Engine Visibility, you can further analyze the content on your Web pages to ensure you use the keywords most likely to improve your ranking. From the Optimize tab, click Analyze Content, and then click Get Started. Using the Back and Next buttons, select the page you want to analyze. Your Keywords — A listing of your Search Engine Visibility saved keywords. Occurrence — The frequency that a specific keyword is included in the contents of the Web page. Density — The percentage of times keywords are used within the total indexable words on a Web page. Optimal keyword density is 2.5 to 4 percent. Continue analyzing content until you have reviewed all your site’s pages and identified the best keywords. Use the How search engines see youarea to view actual word and phrase saturation on your Web page. This information lets you determine if you need to update your saved keywords or revise the content on your site. Once you update the meta tags and content on your website, you can click Rescan to view updated results. To establish site ranking, and determine how your site appears in search results, search engines look for meta tags, a robots.txt file and a sitemap file. Search Engine Visibility V1 helps you optimize this information to increase traffic and make your site easier to find. Typically, you manually add this information to your site by editing and uploading files. If you use Website Builder V6, however, you can automatically send the information you created when setting up your Search Engine Visibility V1 account. Note: To send Search Engine Visibility V1 information to Website Builder V6, both products must be in the same customer account. We recommend you backup Website Builder V6 before you send information from Search Engine Visibility V1. For more information, see Backing Up or Restoring Your Website. Click Manage for the account you want to access. Warning: CAUTION: You might have multiple Search Engine Visibility accounts for a single Website Builder V6 domain. If you do, use the same Search Engine Visibility account when sending information to Website Builder V6. Otherwise, you might unknowingly overwrite meta tags, robot.txt, or your sitemap with incorrect information. Optimize Tags — Complete the fields for the settings you want to export to Website Builder, and then click Publish All Pages. Control Crawling — Complete the fields for the settings you want to export to Website Builder, and then go to Get File and select Export to Website Builder. Create Site Map — Complete the fields for the settings you want to export to Website Builder, and then go to Get Site Map and select Send Site Map to Website Builder. Log in to your Website Builder V6 account and follow the prompts to import the SEO information. After importing the information, you can modify it. Launch the Page Designer, select the Page tab, and then go to the Properties icon. Search Engine Visibility is an all-inclusive search engine optimization tool. It takes the guesswork out of increasing your site’s visibility by providing keyword suggestions, content analysis, tag optimization, site map tools, submission to search engines, and reports for tracking progress. This article explains how Search Engine Visibility works. Generate Keywords — Search engine crawlers use keywords to determine a site’s relevance to searches by Internet users. This tool suggests keywords based on keywords and phrases you enter in the search. You can then select words and phrases from the list or define additional keywords. Analyze Content — This option provides an additional analysis of your website’s content. Search Engine Visibility looks at your site content to further determine the best keywords and their compatibility with your website’s content. For more information, see Analyzing site content . Control Crawling — You can have a little more control over the areas of your site that search engines might crawl. This tool lets you set preferences for your site’s pages and the way search engines crawl them. Submit — The submit tool is your one-stop shop for submitting your site’s URLs directly to popular search engines and directories.